Imagine yourself and your family in a new custom home with contemporary features and a modern design. Dream further about living in a well-maintained neighborhood within walking distance of schools, recreation space, and other amenities, and with easy access to transportation and shopping. It doesn’t have to be just a dream! In The Town of Whitehall, you will be living in your new home sooner than you ever thought possible. Montchanin Builders, can make your dreams an immediate reality. 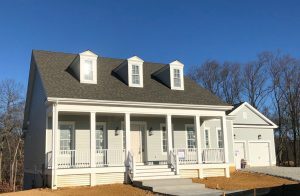 We have three amazing move-in ready homes in The Town of Whitehall in Middletown, Delaware! All three of these homes reflect our trademark quality craftsmanship and materials, with open floor plans and contemporary living spaces that will cater to all of your family’s wants and needs. 2004 Apex Close – SOLD! We designed and built the bungalow at 2004 Apex Close for homeowners that want more than 2,400 square feet of living space, including three bedrooms and three full baths, in a single-floor layout. This home gives you a further option to expand into the garden level for an additional 1,100 square feet of family room and a fourth bedroom space. It sits on a quiet cul-de-sac that backs up to a wooded area to give you and your family the safety and privacy that you desire. You will relish your new home and neighborhood as you relax on your front or back porch, enjoying nature and peaceful neighborhood vibe. For even more living space on the same peaceful cul-de-sac, look no further than Montchanin’s award winning Salisbury model at 2005 Apex Close. This home features high-quality maple cabinets and granite countertops with Whirlpool kitchen appliances that will help you to bring out your inner gourmet. Its spacious rear deck brings your living space into the outdoors to give you a chance to enjoy your wooded backyard. The home’s oak staircases, designer ceramic tiles, and gas fireplace will give you and your family many years of comfort and enjoyment. With more than 2,100 square feet of living space and all contemporary design features, stop by and visit Montchanin Builders’ bungalow home at 550 Wheelmen Street. This home features three bedrooms and two baths on its main-level living space, with a full walk out lower level rarely found in Middletown. 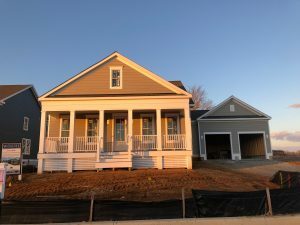 This home’s front porch and rear deck give you every chance to enjoy the outdoors and your new neighborhood, and its interior features give you access to everything you and your family need to keep up with a busy lifestyle. Like our other house designs, this home includes an attached 2-car garage and a mud room and laundry areas. You will also appreciate the maple shaker style cabinets and under-mountstainless kitchen sink in your new kitchen. Relax at the end of your day in a living room as your gas fireplace takes the chill off of a cool evening. When you buy an older existing home, you typically get less than you want. If you start from scratch and design your own house, you will embark on an expensive journey that will likely take at least two years before your home is ready for you and your family. 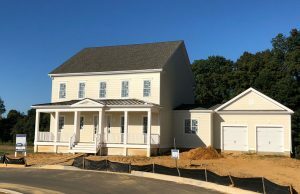 Montchanin Builders’ custom homes in our Delaware communities give you the best of both options, with layouts and features that satisfy all of your expectations and an opportunity to move in immediately. Our Whitehall community in Middletown is less than 20 minutes from Wilmington. The community is excited to announce it has just broken ground on a new elementary school in the State’s #1 ranked Appoquinimink School District to accommodate 840 students on a 13-acre campus that was donated to the District. Please see our website or contact our friendly, professional staff for more information on how to make your dream of living in one our move-in ready homes become a reality.